Beautiful certificate from the Chevron Overseas Finance Company issued in 1967. This historic document was printed by American Bank Note Company and has an ornate border around it. This item has the signatures of the Company's President and Treasurer and is over 40 years old. 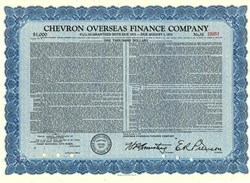 The Chevron Overseas Finance Company was incorporated in 1967 as a wholly owned subsidiary of Socal. Chevron was formed for the purpose of making investments in, including loans to, Socal's foreign subsidiaries and affiliated companies and other foreign companies.